Bio: Rachel is a native of Northern Virginia and lives in Leesburg with her husband, William. Frequenting the National Gallery in Washington, D.C. with her three sisters when she was 8 years old is when her deep admiration for the Pre-Raphaelite artists, their dedication to excellence and her own passion for art began. Throughout high school, Rachel studied pastel and portraiture under portrait artist Patricia Rice . She briefly attended Liberty University in Lynchburg, Virginia where she intended to study nursing. But as she began drawing bones she quickly returned to her first love, which has always been painting. Rachel studied classical portraiture with Lisa Semerad, Timothy J. Chambers, and in New York with master pastelist, Daniel E. Greene. 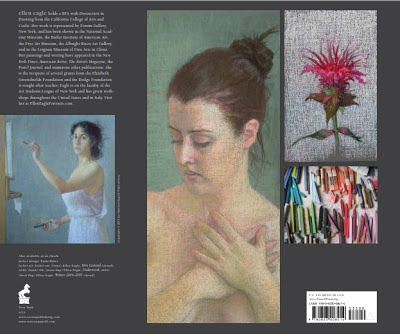 Rachel has work in private collections internationally, is a member of the Portrait Society of America, and is a member artist of Gallery West in old town Alexandria, Virginia. She also travels abroad for new inspiration and has painted a variety of scenes and subjects from her time in Israel, Ireland, and Greece. Navigation: All links remain available on top of page. Gallery: Portraits and Figures; Still Life and Floral; Reproductions; The Emerald Isle. Bio: Nicole Vasseur was born in Bourges, France, in 1954. 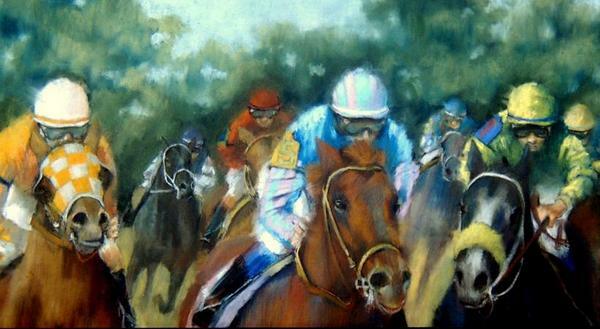 She taught herself the basics of drawing, tried out oils and acrylics, before specialising in pastel. She joined an artists’ association in Saint Florent sur Cher, in 1988, becoming President from 1997 to 2002. She is currently vice-President of this Groupe Artistique Florentais. She has had solo exhibitions of her work in 1997 and 2002, and had shown in group exhibitions in Paris as well as in regional shows. 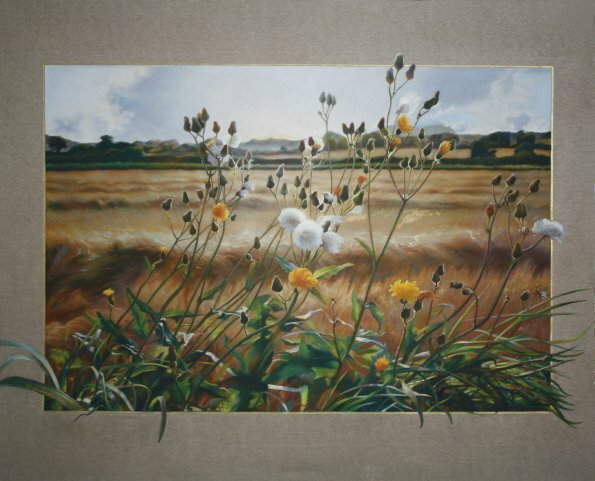 She has won many prizes for her pastels (see website for details) and has been guest artist at Marmagne, Sancoins, la Chapelle St Ursin, at Lunery and at Lye in 2009. Holding a Diploma from the Fédération Nationale de la Culture Française, she has participated in the Festival National des Peintres et Sculpteurs de Bordeaux ; the Salon des Peintres et Sculpteurs of Nantes, the Autumn Salon of l’Ecole de la Loire at Blois ; and at the Art and Poetry Salon of Touraine at Tours. Nicole teaches pastel, including a session at the Université Populaire de Bourges in 2004. Most recently Nicole’s laurels include the 2010 Grand prix du Salon des Amis de Montmartre at Issoudun ; 2012 Prix du Conseil Général at St Florent sur Cher ; Grand prix du Salon des Aix d'Angillon ; Prix de la Communauté de communes at the Salon de Pastel en Périgord, and in 2013 the Gold Medal at the 31st salon of the Val du Cher à St Victor (03) – and the 1st Prize for Pastel at the Salon des Arts Bourbonnais at Vichy. Navigation: Website is in French. Galeries opens to a selection of themes; once chosen, one cannot move from one themed gallery to another, but must navigate via back-button or return via Main Menu which remains available at side of page. Gallery: Galerie Paysages (Landscape) ; Galerie Fleurs (Flowers) ; Galerie Tableaux Modernes (Modern Paintings) ; Galerie Abstraits (Abstract); Galerie Divers (Various). Image View: Thumbnails enlarge somewhat in pop-up window and may not be saved. Dimension is stated. Le bord du chemin is 85x100 cms. Bio: After an early career as a schoolteacher, followed by a period running his own business, Peter Seltzer took the plunge to being a full-time fine artists, As a result Peter is now a Master Pastellist of the Pastel Society of America; he is also a member of Allied Artists of America, Audubon Artists and Hudson Valley Art Association. 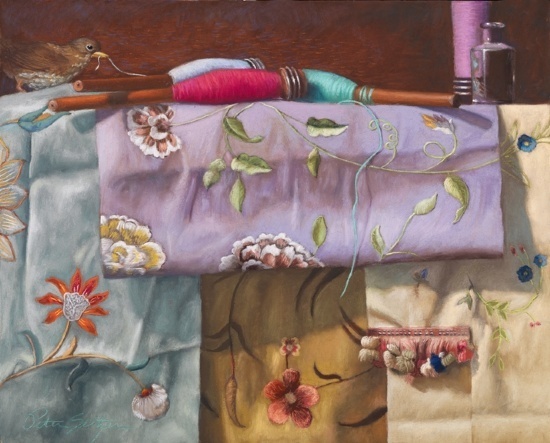 His awards for his artistic achievements are too numerous to mention here; suffice it to say that he has won the Dianne B. Bernhard Gold Medal Pastel Society of America, on several occasions, and 1st place, Still Life category in the Pastel 100, 2005. Apart from private collectors, his paintings are in some prestigious public and corporate collections, including the Butler Institute of American Art, Harvard University, Uniroyal Chemical International, and American Savings Bank. 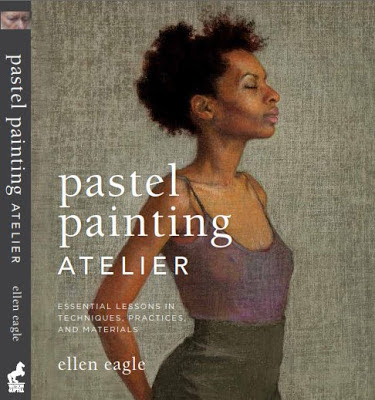 His work has been featured in the Pastel Journal in 2001, 2002, 2006 (in depth interview, June issue), 2009, 2010 and 2011; also in the Artists Magazine, 2002, 2011, and American Artist, 2004, and 2007. Peter has also been showcased in a number of pastel books, including Best of Pastel 1996, 1998 and 2006; and the French l’Art du Pastel, 2006. He is included in Who’s Who in American Art. Subjects: Still lifes and Figures. Style: Representational in execution. Compositionally complex. Bio: Brian Sauerland received his Bachelor of Fine Arts degree in 1990 from the Milwaukee Institute of Art and Design. While attending there he began working with pastels and he has concentrated since then on paintings in pastel. Brian is a Signature Member of the Pastel Society of America, and holds memberships in Chicago Pastel Painters, where he is Vice President and Distinguished Member (DCPP), the Midwest Pastel Society, the Wilmette Arts Guild, and the Great Lakes Pastel Society. 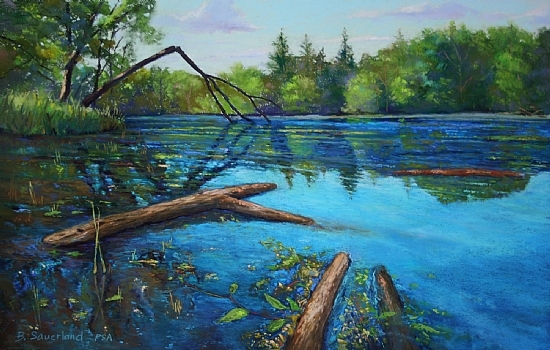 Brian has been winning awards for his work since 1986; most recently an Honorable Mention in the 14th Annual Pastel 100; a Bronze Award in the 13th Annual Pastel 100; and a feature article in the Pastel Journal April 2012 issue. Also the Jack Richeson & Company Award - 2011 Chicago Pastel Painters 3rd Biennial National Juried Exhibition. Brian currently resides in Palatine, Illinois. Subjects: Landscapes, still lifes and portraits. Style: Representational. Brian says he is influenced by many styles and periods of art including Impressionism and by various artists such as N.C. Wyeth, Edgar Degas, and John Singer Sargent. Gallery: Winterscapes; Landscapes; Still Lifes; Portraits. Image View: Thumbnails enlarge in viewer and may be scrolled. They will enlarge further in a new pop-up and download is possible. Snapped is 15x24 ins. Bio: Alan Larkin received his B.A. in art from Carleton College in Northfield Minnesota in 1975 and his M.F.A. in printmaking from the Pennsylvania State University in 1977. He has been teaching drawing and printmaking for the last 31 years at Indiana University South Bend. Alan spent the first 13 years of his time at IU South Bend working almost exclusively in the area of printmaking, particularly lithography. 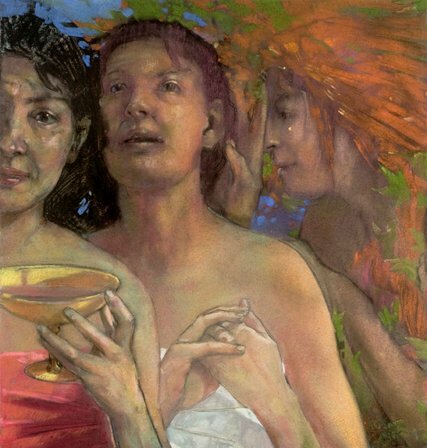 In 1991 he began to focus more on pastel drawing and oil painting. He has won numerous prizes in regional and national competitions for his artwork including the Great Lakes Pastel Society Award at the 29th Annual Exhibition of the Pastel Society of America in 1999 and the Best of Show award at the 75th Annual Hoosier Salon Exhibit in Indianapolis. His works are in numerous private collections including the corporate collections of Pillsbury, NIPSCO, and Lincoln Life Insurance Companies. He is represented by the Castle Gallery in Fort Wayne, Indiana and the Spurious Fugitive Gallery in South Bend. Articles have been written about him in both American Artist Magazine and the Pastel Journal. Navigation: Navigation is straightforward. There is no content in the About the Artist link, other than the 2009 promise of “coming soon”. How hard can it be to cut and paste something from Google and save one (me!) the search? Gallery: Complexities (One pastel); Contemplations (medium not mentioned); Dressing up (13 pastels); Games (8 pastels); Illuminations (2 pastels); Interludes (Oils only); Interventions (3 pastels); Myths and Metamorphoses (5 pastels); Premonitions (lithographs); Reveries (4 acknowledged pastels); The Small World (medium undeclared). Image View: Thumbnails enlarge in Flash viewer; information is generally (not always) provided on medium and dimension. Download is not possible. Drinking the new spring wine is 20 ins square. Bio: Al Zerries was born in New York City, and graduated from Pratt Institute with a major in advertising. After graduation, he served in the Army as a 1st Lieutenant, Airborne and Ranger qualified. After his military service, he worked for over twenty years as an art director, TV producer, and creative director at a number of Manhattan ad agencies. He also taught advertising at the School of Visual Arts. In the mid-nineties, Al began to paint - he studied with Burton Silverman 1998-2000. Since he began showing his work in 2001, he was in over 225 national and international exhibitions, with his paintings winning awards in over half those events. His work was honored with 15 Best In Show awards. Continued acceptance earned him the status of Elected Member or Signature Member in more than 30 distinguished societies, including the American Artists Professional League; Audubon Artists, Incorporated; Degas Pastel Society; the Watercolor U.S.A. Honor Society; the American Pastel Society; and numerous regional art groups. Al’s work appeared in the pages of the Pastel Journal, December 2008; and also in The Artist’s Magazine and Watercolor Artist. Al was the victim of a hit-and-run in February, 2009. Demo/Blog: No. There is a tribute to Al on YouTube . Bio: Brian Cobble was born in 1953, in Ohio. He got his BFA in 1975, New Mexico State University, Las Cruces, and in 1977 his MFA from Southern Methodist University, Dallas, Texas. He attended the Skowhegan School of Painting and Sculpture, Skowhegan, Maine in 1977. Although his training was chiefly in oil painting, Brian fatefully turned to pastels when oil paints began to irritate his eyes, pleased and surprised at what he could achieve with them. Brian had his first solo exhibition in 1978, and ever since has had numerous solo and group shows, garnering many awards along the way. 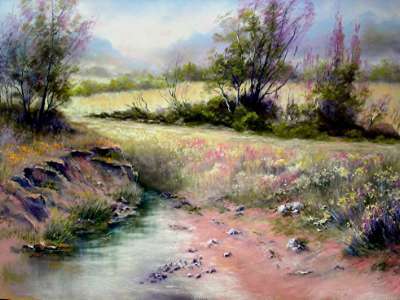 In the last decade he has been awarded First Place, Art Spirit Foundation, Dianne B. Bernhard Gold Medal Award in the 31st Annual Open Juried Exhibition for Pastels Only, Pastel Society of America; he was named Master Pastelist, by the PSA in 2006; he won the Pastel Journal Grand Prize Award in the 2007 Pastel 100; and in 2008 he was awarded First Place, Twelfth Juried Exhibition: Web Show, International Association of Pastel Societies. He was the Juror for Landscape and Interior in the 2012 Pastel 100; his evaluation of art typically begins with a sort of “gut reaction” - stating that “If you’re jealous of it, it’s probably good”. Brian’s work has been featured in numerous publications, from American Arts Quarterly, through Southwest Art, the Pastel Journal (April 2006 and April 2008), Dallas Arts Review, the Artist’s Magazine, and American Arts Quarterly. Apart from private and corporate collectors, Brian’s work can be seen in such varied public collections as the El Paso Museum of Art, El Paso, Texas; the Museum of Fine Arts, Santa Fe, New Mexico; the Columbus Museum, Columbus, Georgia; and the Tyler Museum of Art, Tyler, Texas. To learn more about the art of Brian Cobble, one can do no better than read the two essays on his website. There is little point in my rehashing them here – read the originals! Brian Cobble’s own essay refers to his influences, his work ethic and his technique. The artist currently lives in Albuquerque, New Mexico. Technique: Brian works chiefly on Strathmore Series 500 Illustration Board or even watercolour paper mounted on board for larger works. A coat of clear gesso for tooth is followed by underpainting in oils, acrylics, or gouache, before pastel is applied. Style: Representational. Cobbles landscapes are quintessentially American; often unpeopled; there is certainly an echo of Edward Hopper; although Cobble cites George Inness, Charles Burchfield, Maynard Dixon, Daniel Garber, Samuel Colman, among the artists who inspired him. Navigation: Navigation is simple, straightforward. Demo/Blog: No; but read the essays.